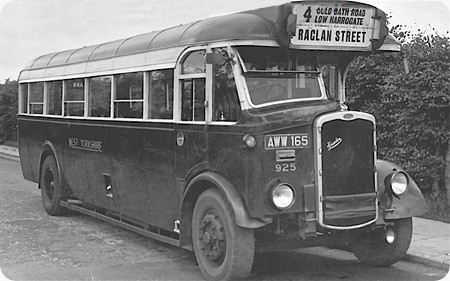 This picture was taken at York Station in 1937, and shows the vehicle, in its original livery, on the ‘Circle’ route – 1/8, Tang Hall – Beckfield Lane – Burton Stone Lane. The vertical line in the middle of the ‘bible’ indicator clearly suggests that the flap would have been turned over like the page in a book rather than being raised or lowered. However, the entire ‘bible’ would have needed to be changed some 15 or 16 times a day on this service – something of a chore for the crews. To my shame, I have to say that, despite some of them being in service until 1952, I have no personal recollection of the Y-WY GO5Gs; the 1939 K5Gs, (and the 1938 K5Gs, after rebodying), were regularly used on routes with which I was very familiar and I knew those buses well, but I just don’t remember the GO5Gs. My only excuse is that Y-WY introduced Bristol K6Bs on the circle route – maybe in part because they had blinds – by the time I was about six years old, so the GO5G’s must have been used elsewhere in the system, (e.g. taking John Whitaker to Leeds!). Behind Y327 is Y413, an ex-West Yorkshire lowbridge Leyland TD1; opposite is Y329, another GO5G. My thanks to Keith A Jenkinson for his kind permission to use the picture. There is something about the character of Bristol buses…old ones anyway. Business like, efficient, and thoroughly economic, and absolutely oozing with character. This photograph just sums it up for me. My Bradford based memories are of the lowbridge variety, so it was always a pleasure for me when, as a child, we went to, or through York, as the highbridge version was a rare treat. Thanks for the memory Roy! West Yorkshire Bristol GO5G 306 with Eastern Counties L53R body built in 1935 is seen at Bradford Chester Street Bus Station about 1950. It is ready to depart to Baildon via Canal Road and this information is clearly displayed on its “bible” indicator. For its return journey, the conductor or driver would release the side clips on the ‘bible” to enable the horizontal flap to be turned to show “Bradford.” The intermediate destination points in reverse order would also be revealed on the hidden “page” after which the ‘bible” was then re-clipped. No doubt the crews welcomed the adoption by West Yorkshire of roller indicator blinds from 1944 onwards, though the operating handles were still outside and involved a clamber over a hot radiator but there was no more awkward lifting of a heavy “bible” metal sheet arrangement. I wonder what injuries occurred and whether there were any compensation claims with handling of the “bible” indicator metal sheets. 306 was withdrawn from service at the end of November 1950 but the “bible” indicators remained in use with West Yorkshire I believe in 1958 with the demise of the last pre-war Bristol L5Gs. Can anybody confirm the date of the last pre-war L5Gs? 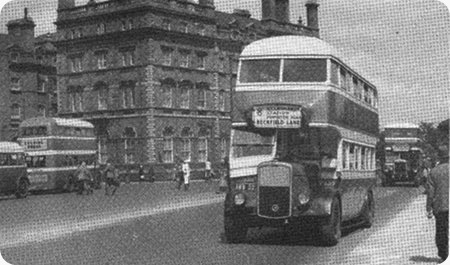 I have only West Yorkshire fleet lists to 1955. Thank you Richard for sharing with us this wonderfully composed and evocative picture. I have departed from that very spot countless times when I worked for West Yorkshire at Ilkley Depot. We operated services 63/68 to Ilkley and Ben Rhydding via Manningham Lane or Canal Road, and had just one weekday trip to Baildon – out via route 59 and Baildon Road and return via route 61 and Baildon Green. I never had to use the incredible and ludicrous "bible" indicators and, quite rightly, they would never have been permitted in today’s Health and Safety climate – this legislation is often sneered at, and can be "over the top" on occasion but it was certainly sorely needed in those days. At a quick glance it would appear that the last prewar L5Gs were indeed withdrawn in September 1958. Of interest is the "Tilling Group" swivel radiator filler cap, retro fitted to most vehicles in place of the original flat screw down pattern. Thanks once again for a particularly splendid picture. I know I am susceptible to nostalgia, buses being no exception, but this photo has it all for me! As a child, I remember the shape of the ECOC "G" bodies so well, as they contrasted vividly with the post war fleet. They lasted until 1952, as they had provided cover for the company’s "K" type rebodying programme. I can see them now, hurtling down Thornton Road from Denholm, leaving clouds of smoke in their wake. What a place Chester Street was for a young enthusiast. Day trips to Baildon and Ilkley on such delights as 306, and their "J" cousins, and stopping off at Harry Ramsdens on the way back. Most of all, awareness of contrasting shape variations amongst the WY fleet. There was that green hut, full of stacks of spare bible indicators, and, as you exited the bus station, at the little parking area to the right, bus backs of differing profiles would persuade you of the delights of BOVRIL, or else pose the question, "Have you McLeaned your teeth today"? Wonderful memories of a superb fleet in its heyday! Can it be 60 years since the passing of these fine vehicles? Thanks to Richard for this post…. Any more WYRC Co. enthusiasts out there? Yes, a lovely picture with much nostalgic value. I didn’t realise that ‘bible’ indicators were still in use as late as 1958 – they lasted until 1955 in York, where I never heard them referred to by any of the older staff as anything other than ‘flap boards’. West Yorkshire must have been very fond of them because they actually converted some of the vehicles they inherited from York Corporation to bibles from blinds. The picture indicates, and I assume from Richard’s description, that the hinge was horizontal and that the flap was raised or lowered. That’s how I remember them, but I have seen photos, (pre-war), clearly showing a vertical hinge where the flap was turned like a page in a book. Can anyone throw any light on this? In addition to being heavy and awkward, a problem with ‘bible’ indicators arose when the vehicle operated on more than one route. It would then be necessary to carry another board, either under the staircase or, on a single-decker, lodged between the bonnet and nearside mudguard. York’s Circle route, with three different destinations, would require a change of board every hour; some photographs suggest an additional slip board, just showing the change in intermediate route points, but I really can’t be sure about that; however the problem was solved, it would have been a tiresome bind for the crews, no doubt. Thank you again, Richard, for this great picture. How did you get a 5G like this one up Browgate into Baildon? With great difficulty? I remember the ‘flap boards"on York buses: they gave the York fleet a wonderfully old-fashioned & "foreign" look that went with the rest of the place- and the white boards went with the white "lavatory brick" so often seen in York (sorry- "Yark”)! Roy you are quite right – although in the minority there were versions of these boards where the hinge was vertical and the pages turned "book fashion" – I remember them well and they were around after the War also. Additionally there were other lightweight boards with only one narrow line carrying the ultimate destination in black and the route number in red. They were shaped like a letter "H", with slender legs at either side and the narrow route line midway between bottom and top – these must have been far easier to "hoist aloft" than the full size multi-leaf monstrosities. Joe, you’ll have the Gardner legal team after you!! Slow steady progress in low gears was essential of course, but the big hearted Gardners would go anywhere you know – however Browgate did admittedly often demand first gear. I have a wonderful piece of video which I took on an enthusiasts’ outing on preserved KDG 26. Knowing what was to come I positioned myself on the nearside front seat and the superb and highly competent driver chose just the right moment to execute a masterly change into first gear without the slightest jerk or click. I often wonder to this day how the GO5Gs and similar models managed to achieve Leeds to Harrogate in virtually the same running time as the present day despite having to tackle the ascent to Moortown, Harewood Bank and Almsford Bank and so forth. Eastern Counties were also users of bible indicators although whether they lasted into the fifties I couldn’t say. Lancs United had their own variant on the bible this was the slot in stencil which was a metal stencil which was back lit. The boards were dropped into the indicator box by the conductor. 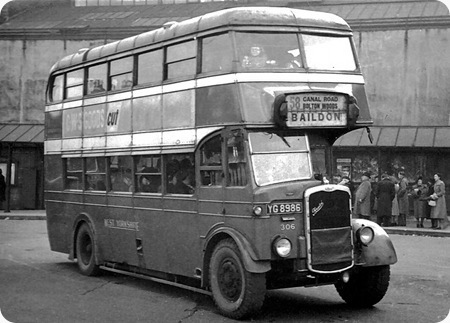 On double deckers the boards were kept under the stairs and would occasionally fall over with a great clatter. Preserved LUT Leyland Tiger 114 CTF 423 a 1938 TS7 with Roe bodywork has had the feature restored and can be seen in its restored glory at this link. In 1934 Keighley-West Yorkshire took delivery of two Bristol G-types – K111/2 (YG 5733/4) – which were the first Bristols to be fitted with Gardner’s new 5LW diesel engine. Previous G-types had been powered by Bristol’s own design of 6-cylinder petrol engine, and indeed the chassis of K111/2 were originally to have been powered by this unit. However they were modified to take the Gardner engines during construction at Bristol, and were subsequently given chassis numbers GO5G.1 and GO5G.2, denoting G-type, Oil engine, 5-cylinder, Gardner. The vehicles were of further historic interest as they were West Yorkshire’s first Bristols and also the first Bristols to be fitted with lowbridge bodywork (in this case 52-seaters by Brush). Further GO5Gs were delivered to WY in 1935 (including the imposingly handsome 306 in the photo), these as mentioned having ECOC bodywork – the forerunners of what would become Eastern Coach Works. Thus started WY’s long and happy relationship with the hallowed trinity of Bristol chassis, Gardner engine and ECW bodywork that lasted into the ‘Bristol’ Olympian era – only thwarted when Leyland short-sightedly closed the Bristol factory in 1983. Regarding Joe’s comment on the progress of 5Gs up into Baildon, I well remember a WY fitter commenting that they might have been plodders but they were unbelievably reliable and very economical. His quote was that "they might be slow but they could pull‘t town hall down on a pint o’ diesel!" He may have had a point! I can certainly vouch for Brendan`s comment about the pulling power of WYRC 5LW engined buses. I well remember hearing each cylinder in its separate firing as a G mounted Baildon Brow. They could have gone up a house side without stalling! I have similar memories of 5LW West Yorkshire buses on Garrowby, and Hollins Hills! The AWW batch of 1935 was less common in Bradford, but their reversion to a 6 bay layout was more a return to norm, with the 5 bay batch being very much an exception in ECOC output, a position which continued for the rest of Lowestoft’s pre war production. Strangely enough, photographs of the AWW batch seem to be difficult to find. Several sources quote West Yorkshire, and Eastern Counties as being the only users of the so called "bible" indicator. There were detail differences between the "bibles" of the 2 operators, principally with regard to the illuminating "side lights" as used by ECOC. Of all the (superb) Tilling Group (or Ex Tilling after 1948) companies, ECOC was, perhaps the most typical. Flat terrain enabled the extensive use of 4LW as well as Gardner "5"s, and vehicle life was maximised. All in all, it was a fascinating fleet, and one which I, as a West Yorkshire fan, would love to read more about! Nearly a year later I have just read Phil J’s memories of the bare chassis arriving at ECW from Bristol Commercial Vehicles. Seeing those brave men drive off from the Works in a convoy of 5/6 at a time was a regular sight when I was young and riding my three wheeler bike to wait by the Works entrance to see them set off. Exactly as Phil says, there was no protection of any kind except a canvas sheet in front of the pedals and that bare box to sit on..gosh it must have been horrible to travel so far..about 160/170 miles on A/B roads back then and on a writhing, floppy chassis with springs set up to take the body weight. They did indeed wear goggles and most wore "Herbert Johnson" motorcycle crash helmets and a scarf over the mouth to combat flies. On a cold Winter’s day it must have been absolute misery for them. Those big overcoats were always a golden fawn colour..until the front got plastered in dirt and oil when they became "two tone" in a rather unusual way!